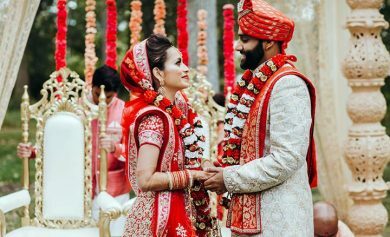 If a magnificent Hindu wedding ceremony is written in your stars, then you and your significant other have a lot in store for, as far as the cards say. I wasn’t talking about your wedding cards in that instance, just to be clear; though, that is actually what exactly your wedding cards will have as well. Anyway, moving right along. The wedding invitation card is the announcement of the dates of your final nuptials; having already announced your intentions of getting hitched, you are now making the clarion call to assemble for the ceremony that will tie you and your partner together for the rest of your lives. To mark this auspicious occasion, it is custom to send out cards as invitations, letting your intended guests know exactly what is on the menu, and not literally either. 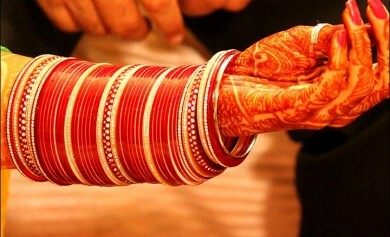 It is traditionally filled with the details of the people getting married, the names of the hopefully proud parents, the date, time and venue of the ceremony and any further reception, and when to RSVP by. Let’s get into what makes a good card. Most wedding cards at their most basic come with matching envelopes and a number of complementary leaflets, but that is only the base on which you can add to or subtract from, however you choose. 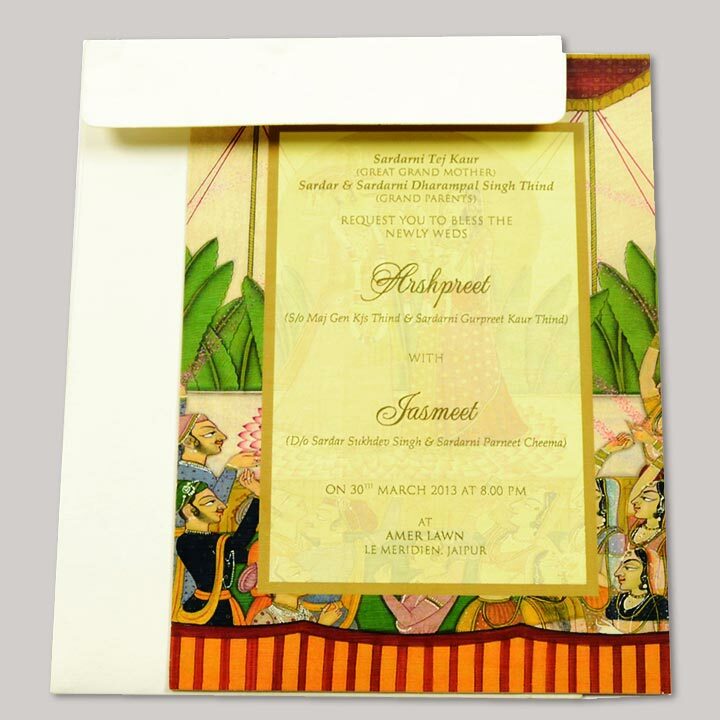 They can be single sheet invitations that are done on shimmery paper, or they can be oddly shaped invitations that are finished on handmade paper that can have multicolour designs that offset themselves well. Depending on your tastes, and the budget that you have set aside for this purpose, you can even have box sets that look like a book and open up to the details of your wedding function. You can have your invitations laser cut to fine tuned precision, you can choose to have an elaborate multi-layered affair done in ribbons; you can even have honest-to-God scrolls if you so deign to. We personally are in favour of the variety of hardbound-thick cards that can be found with a discerning eye. 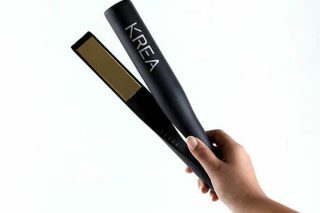 As to the choice of style, the innumerable options will leave you replete. With the grand total of the massive breadth of Hindu mythology to take inspiration from, countless motifs and designs can be found to include in your card. We will now go into some of the more popular themes that can be found. One of the most ubiquitous designs is the ever loved and respected Lord Ganesha. The remover of obstacles, the elephant-headed god is the deity of choice to look after newlyweds and to see that their union is free from all hassles. Thus, there are myriad designs that incorporate his divine visage in one way or the other, some being full blown drawings of the god while others being utterly artful lines of calligraphy that utilise negative space in a sublimely brilliant way to represent his countenance. Next, you would have the representations of the Om symbol; the first sound in existence, it resonated through the entirety of creation. What better way to invoke a beginning, we say. One of the ever present and evergreen designs is that of the inimitably beautiful peacock. This visually stunning bird is a traditional symbol of love and all things romantic. A staple favourite of our artists throughout the ages, they’ve been included in countless paintings to give shade to doe-eyed lovers with their exotic spread of plumage. Another traditional favourite is to have one of the archetypal premier lovers of Hindu mythology adorning the card, the appearance of the fabled Radha and the divine Krishna is sure to set a wonderful vibe to the whole occasion, though of course hopefully one that leads to a different end from Radha’s. Another classic favourite is the door style card that can be opened up. These usually can come in a range of designs which can accommodate all the details of your wedding function and then some. 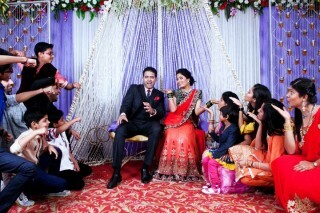 Another popular design choice is to have pictures of the imminent couple as the background for your card. The smiling visages of the two happy people who are intending to enter into a holy commitment for the rest of their lives will greet you as you open up the card, which is hard not to smile at. Floral designs and patterns are also a perennial solve-all for all design issues as they are immaculately adaptable to almost any look. The myriad choices of petals and flowery vines that can be artfully arranged around the content of your card will ensure that it looks regal, aesthetically pleasant, and above all dignified. 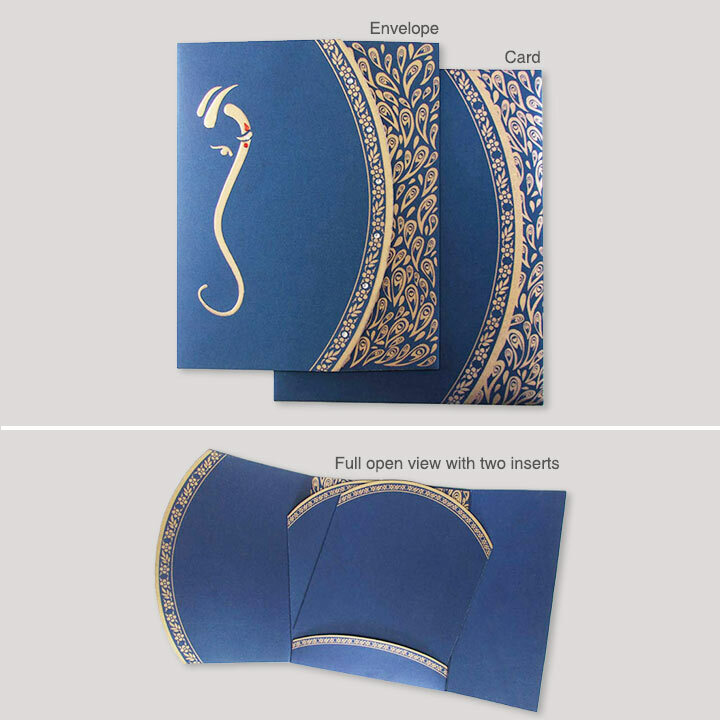 Hindu wedding cards with painted backgrounds of spectacular vistas or other scenes are also choices considered by people for their wedding cards. 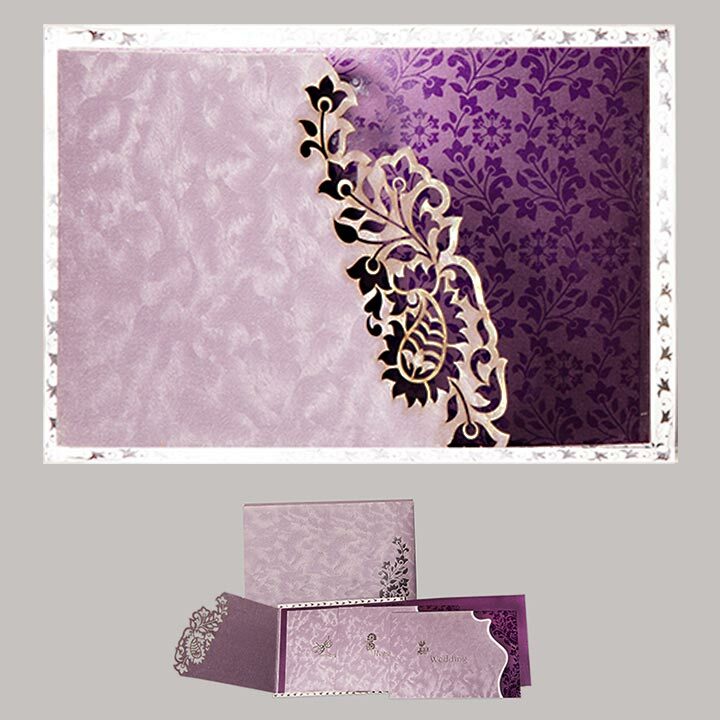 Cards that are finished in a Damask theme are also top contenders because of their intricate and detailed styling. 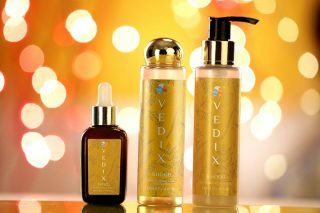 Now that you have a more thorough understanding of the offerings on hand, let us get right into browsing some examples. 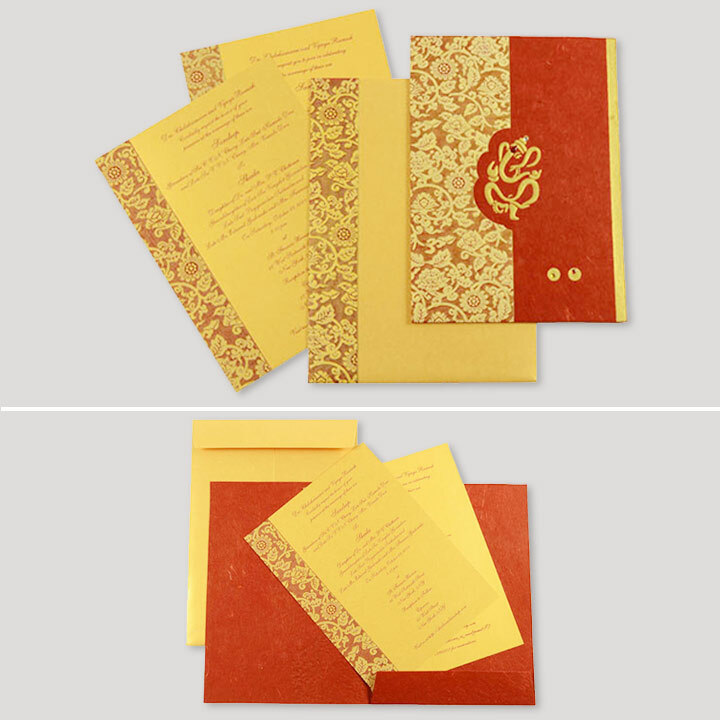 We’ve carefully compiled a list of stunning Hindu wedding cards for you to choose from. Scroll on! 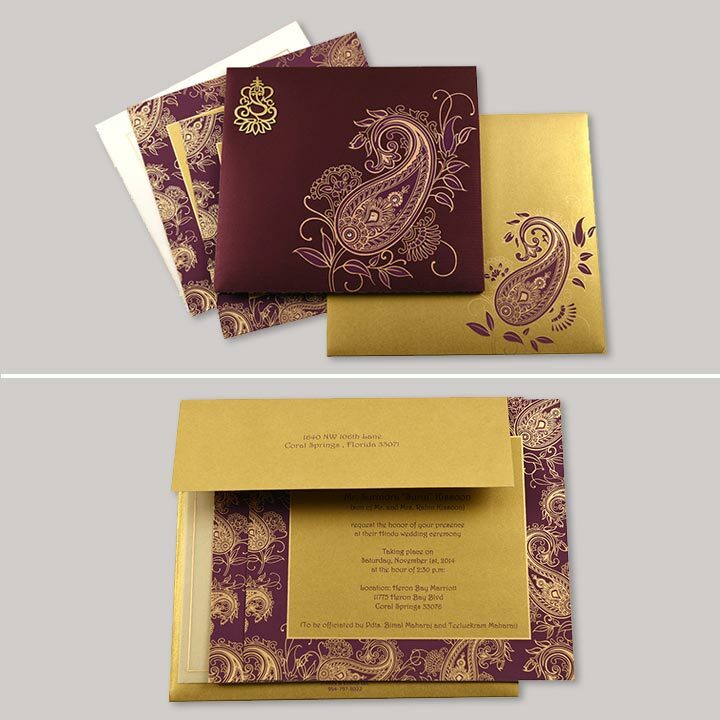 A cream and gold combination, this card comes with a broad border that is done in floral motifs that are embossed over a striped background. The image of Lord Ganesha is complemented by the highlights of the kundan designs. 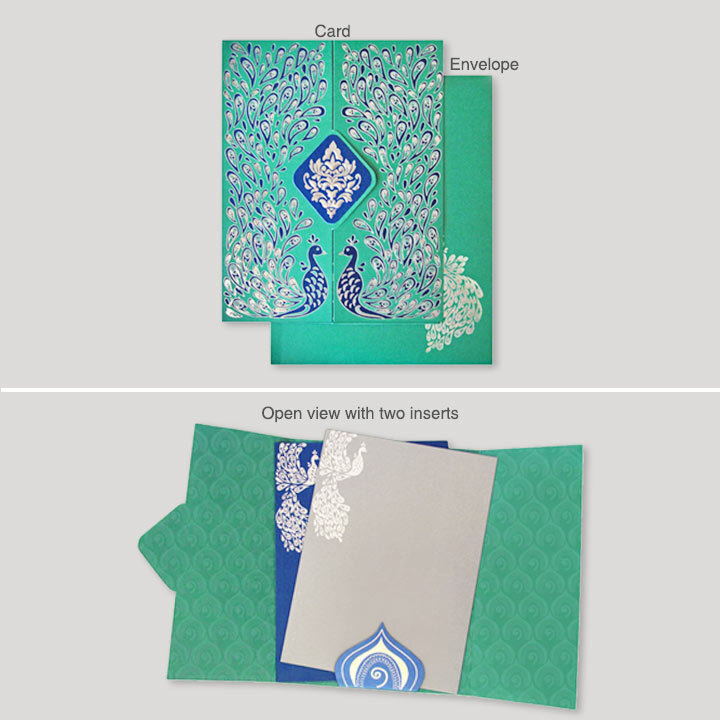 The accompanying inserts have the same border design as the front of the card, and the envelope shares a similar composition as well. This intricately laser cut floral patterned card is simply lovely. Moving in shade from lilac to a deeper purple, it takes the eyes on a visual trip as they wind themselves around the delicate floral patterns. It comes with a matching envelope and stunningly finished inserts. With a mauve tone to some of the inserts, you are presented with a wonderful exploration of that area of the colour spectrum. Finished in high quality metallic finish card stock, this card is elegantly captivating. 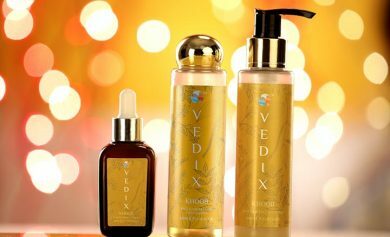 The simple and yet clear embossed lines depicting Lord Ganesha are endearingly beautiful. This mesmerising card comes with a die punched window with a cellophane cover that reveals Ganesha in all his glory even when the card is closed. The brilliant design work is finished with lovingly done rhinestones. 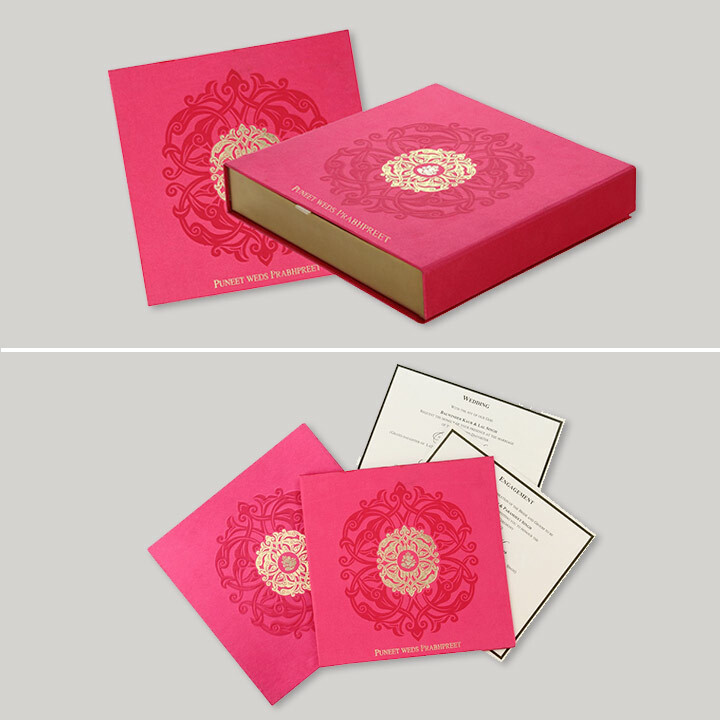 The card comes with a matched box envelope and two complementing inserts. This superb peacock themed card is accompanied by a matching boxed envelope and also two inserts, all made of superior quality metallic card stock. 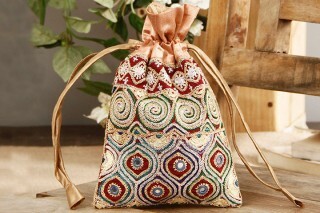 The peacock designs on the inserts are finished in silver foil and are kept in place by a similarly decorated and superbly crafted pouch holder. The front of the card is mind-bogglingly designed with extremely detailed paisley designs that are again finished in silver foil. The elaborate design and motif on the centre panel is also beautifully embossed. 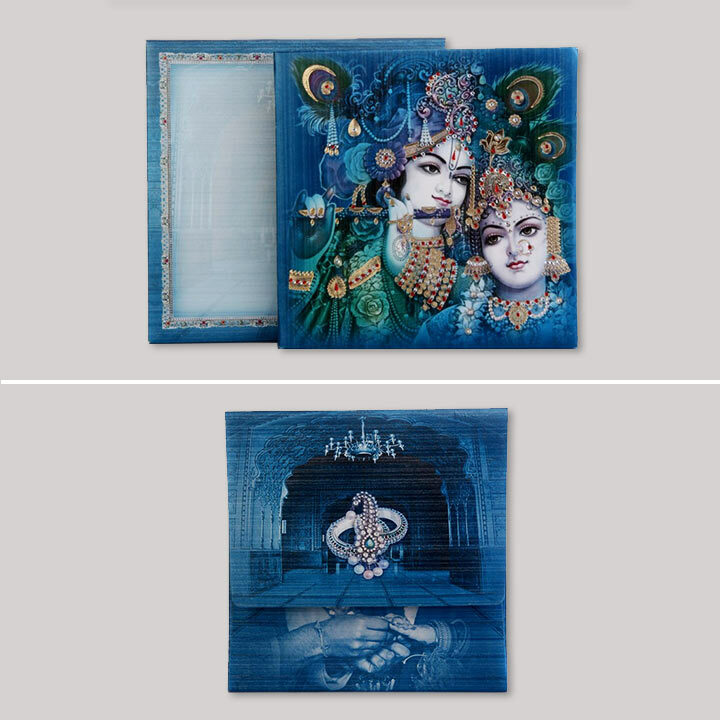 We had talked earlier about the popularity of Radha Krishna designs on wedding cards. Rather than show you an individual card, of which the most important part is the information inside which can be given in any number of formats, we thought we’d give you a taste of the spectacular different designs you can find in this theme. 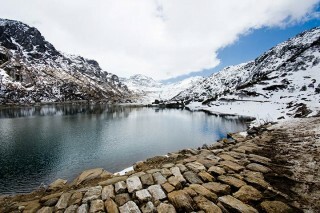 The first one is a resplendent card that is enchanting in its shades of blue. The heavenly couple is lovingly represented in a classical painting style that speaks of masterful work. 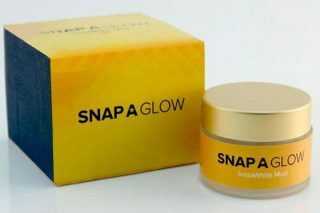 The gold and pearl finishing of the embossing is just some plainly outstanding work. The second one harkens back to the style of the Mughal painters of their golden era, with the adoration between the two lovers being absolutely enchanting. The third is a contemporary, more rakish take on the two subjects; boldly iconic, it is sure to set the tone for what will follow. This beautiful example of the classical painting style wedding card is printed on a silk screen, and can be done so in the colour of your choice. Also a single sheet invitation, it does away with anything unnecessary and remains almost ascetic, except for the simple and yet beautiful painting on the borders of the card. This one is done in the Mughal style, but you can find almost anything. We’ve heard Ram Ravi Varma is quite popular in this category. A stunning marriage of many traditional symbols, this is a brilliant card to announce your own upcoming nuptials. The most striking thing about this design is obviously the elegant curve of the intricately adorned paisley design, which is wonderfully accentuated by the floral undertones. Lord Ganesha resting right at the left hand corner is just about perfect as well. What completes it is the wonderful disparity of the apparently complex but inherent simplicity of the design on the envelope, and the intense amount of detailed designing on the inserts. 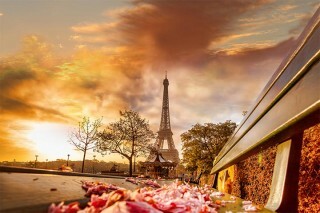 In a word, simply stunning. See, I couldn’t even use one word there, that’s how good it is. One of the better examples of a completely boxed wedding invitation, this elaborate setup will make your guest feel lucky just to know you when they get theirs. Almost looking like a book, or an album, this complete package presents all the information relevant to the guests is superlatively jaw-dropping fashion. Everything from the rich and detailed design motifs that are embossed on the front, to the deep pink of the overall design makes this a wonderful example of a card.